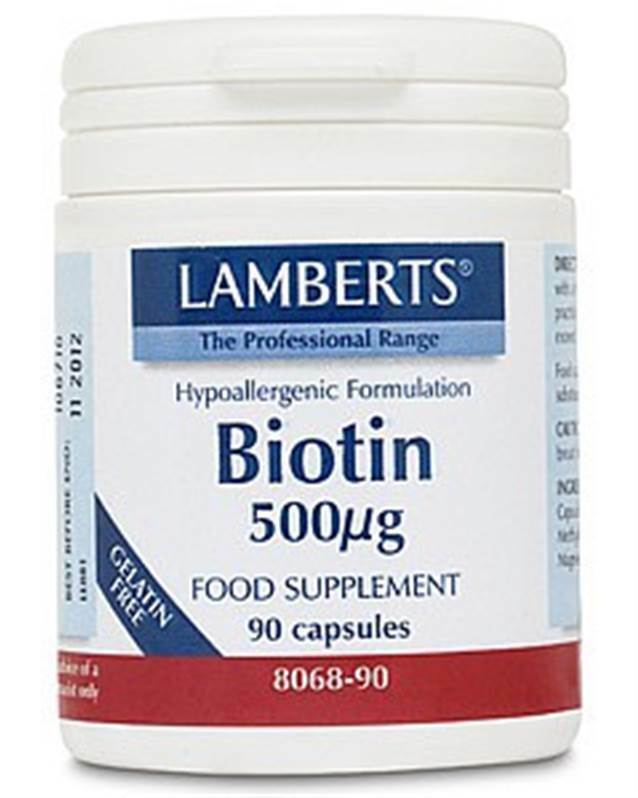 Lamberts Biotin 500mcg - for healthy hair and nails - biotin, plays an important role in the release of energy from food and is needed for the maintenance of healthy hair and nails. This vitamin was first isolated from egg yolk in 1935 and is found in a variety of combined forms in both animal and plant tissues. In the animal it is stored in the liver. Biotin is readily produced by intestinal bacteria although antibiotics and other medications have been shown to affect the bacterial production of this vitamin. The co-enzyme properties of biotin are involved in the processes by which carbohydrate and protein is metabolized for energy release and to take part in the production of prostaglandins from essential fatty acids. In the body it is primarily used to assist with normal growth and development of the skin, hair, nerves and bone marrow. This is a high strength supplement that provides a level of biotin that would be difficult to obtain from most ‘high street’ multis. Each capsule provides a full 500µg of biotin. Rice Powder, Microcrystalline Cellulose, Capsule Shell (Hydroxypropyl Methylcellulose), Silicon Dioxide, Magnesium Stearate.